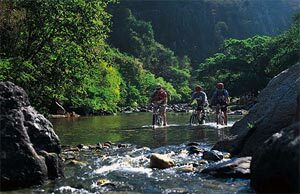 We could arrange Moutain biking in Myanmar Himalaya regions from half to five days or more. 3-4 day mountain biking trips could be an ideal alternative to village trekkings. You could choose to cycle along the rivers through fields, jungles, mountain roads and villages where you could meet different tribes of Myanmar Himalaya (Tai Hkamhti or Hkamhti Shan, RaWang, LeSu, LeShaw, Kachin, etc...) or elephant plaughings. Accommodations are at local villages houses or camping. Biking out of the city is not fun and you will be transferred out of Mandalay for about 20 minutes to avoid the congested traffic. Last a few years have seen the development of an active tour program, 'traveling on the bicycles' in Myanmar. This popular method of touring around the country on the small seat of a bike was first initiated by 7Days Travel & Tour Co. Ltd in Yangon. Bicycle tours provide visitors the best possible opportunity to intimately experience the country in a physically active journey yet a relaxing way. It is with a bicycle the cultural-diversity & natural-prism of Myanmar's reality can only be enjoyed. Do not miss our special biking ( cycling ) tour around Myanmar. Not only our special program, but also glad to do the tailor made one.